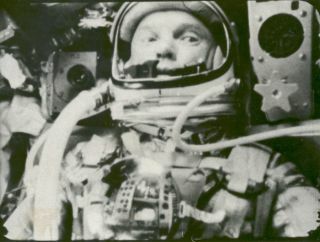 John Glenn aboard the spacecraft Friendship 7 during his historic orbital mission of Feb. 20, 1962. The Discovery Channel will re-broadcast the first episode of its miniseries "When We Left Earth: The NASA Missions" on Sunday morning (Dec. 11) as a tribute to late astronaut John Glenn. The episode, titled "Ordinary Supermen," chronicles the early years of the Cold War space race between the United States and the Soviet Union, with special focus on the May 1961 flight of Alan Shepard (the first American in space) and the February 1962 mission of Glenn (the first American to orbit Earth). "Ordinary Supermen" will air at 9 a.m. Eastern and Pacific on Sunday, Discovery Channel representatives said. Glenn's 1962 flight made him an American icon, but those who knew the man say that he never let the fame get to his head. Glenn — who also flew on the space shuttle Discovery's STS-95 mission in 1998 at the age of 77, becoming the oldest person to reach space in the process — died Thursday (Dec. 8). He was 95. "When We Left Earth: The NASA Missions" is a six-part documentary miniseries that first aired in 2008.